Sure, you could post your outfits. You could post deal round ups. But everyone does this, and most fashion bloggers aren’t getting any traction with this kind of content. How many fashion bloggers do you know who are posting every week – sometimes multiple times – who aren’t anywhere near being able to make a living from their blog? That content usually doesn’t get traffic. Why? Because no one can find that type of content, unless YOU show them where it is (e.g., you post a link in your Instagram bio). If you have tens of thousands of Instagram followers, you may be able to send a small portion of them to your blog, but in my experience, Instagram followers don’t really want to read. They’re on IG for a reason (because they like pictures)! The best way to get traffic to your fashion blog is by creating content that ranks well in search engines and draws organic visitors. That means you have to write about things people are searching for, and you have to make sure your posts are SEO optimized. 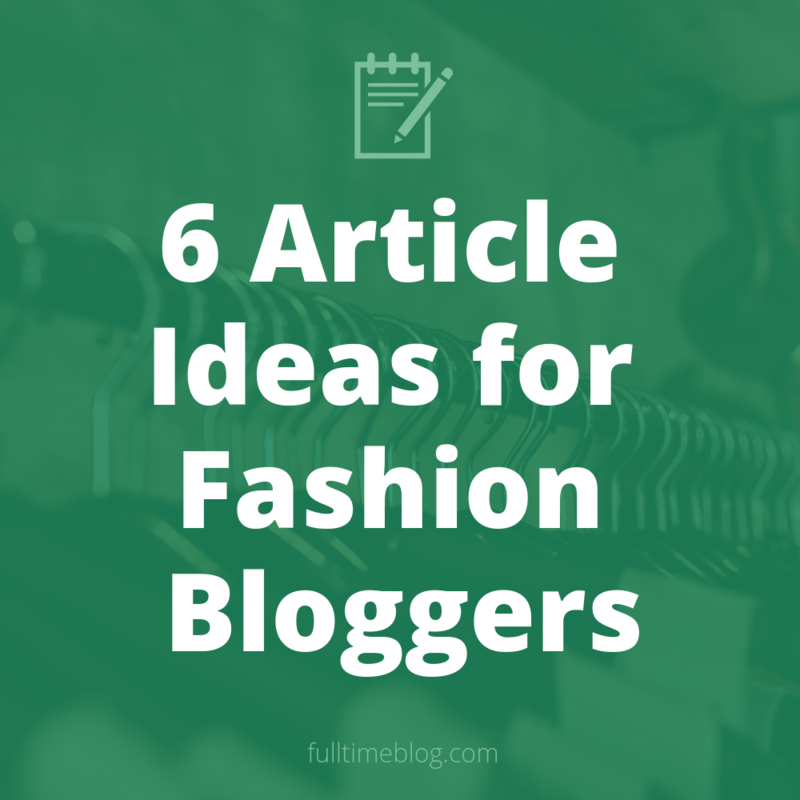 All six of these blog post ideas have the potential to generate organic traffic. To prove it, I’ll show you some examples from my own blog, The Modest Man. This is the low hanging fruit. It’s a great starting place if you’re a new fashion blogger. Why? Because you’re already an expert. You’re already qualified to write in-depth, helpful products reviews for a bunch of different products. You don’t even have to buy anything. Just make a list of your 10 or 20 favorite pieces of clothing and accessories, and start writing. If you own a jacket, for example, it’s highly likely that other people are interested in owning that same jacket. What will they do before they buy any product? Since these search terms aren’t super competitive, it’s not too hard to produce content that ranks highly for them. 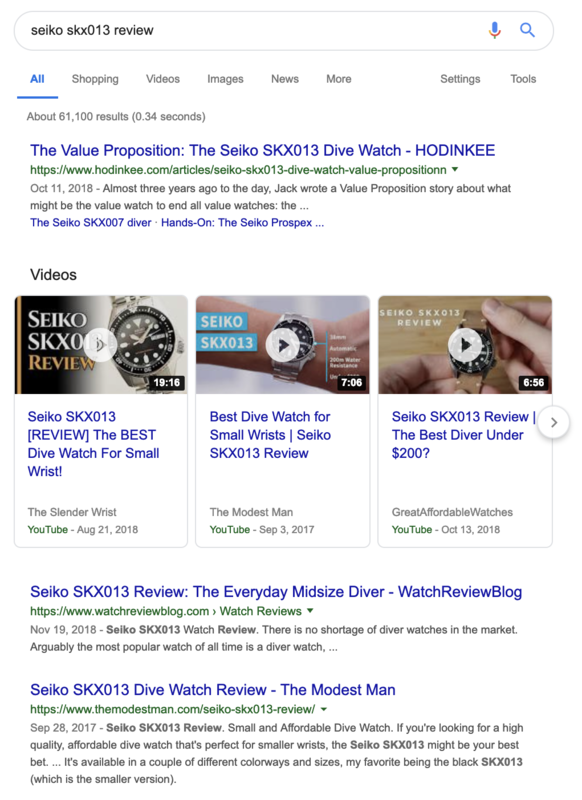 To use an example from my own site, try Googling seiko skx013 review. You’ll see that my video review is the second video result, and my article review is the third webpage result. Since this is a very popular watch, and it’s been around for a long time, this search term is pretty competitive. It would be very hard to outrank Hodinkee, for example, as it’s the most popular watch website in the world. But still, in their current positions, my article and video get thousands of views per month, consistently. Product reviews aren’t just great for organic traffic. They’re also a great way to monetize your blog using affiliate links. If someone is looking for product reviews, they’re probably almost ready to buy that product. If your review answers all of their questions – if it makes the purchasing decision easier – you’ll likely get a commission from their purchase (assuming you use affiliate links throughout your post). That SKX013 review still generates affiliate revenue, even though it’s been over a year since it was published. This is the kind of evergreen content I like to publish! Yes, other sites will outrank mine, as Google values freshness for this type of content, but you can always update your content to give it new life (and better rankings). You might not see any traffic for a few weeks after you publish your review, but I promise that this type of content is worth your time, especially at the beginning of your blogging journey. Challenge: Make a list of 5-10 products that you’ve owned for a while and can write about, in-depth. Write one product review each week this month, and be sure to include photos of the products. I bet you have something that bothers you. Maybe it’s a fashion mistake you see other people making constantly. Maybe it’s a trend you just can’t get behind. For me, it’s the way the retail apparel industry handles men’s sizing. It’s really hard for guys who aren’t average (around 5’10” and 190 lbs) to find clothes that fit. As a shorter man, I’m acutely aware of this problem, so I wrote a couple of posts to vent my frustration. Why Are These 6’2″ Models Wearing Size Medium? To date, these are two of the most popular articles on my site. They’re super relatable and share-worthy. It’s the kind of content that has a lot of people nodding their heads and agreeing enthusiastically. This is the kind of content that can go viral, even in a small way. And it has staying power because articles like this get linked to a lot, which Google loves. Challenge: Write up a rant. Think of something that really bugs you, and just go to town. Set a timer for 20 minutes, and start writing! A “round up” post is one where you gather pieces of content from a bunch of different sources, then put it all together in one epic piece of content. For example, let’s say you have a fashion blog for minimalist women. You could reach out to 50 of the Internet’s favorite minimalists and ask for a quote about minimalism’s role in fashion. I reached to a bunch of men’s style experts (bloggers, YouTubers, etc.) and asked if they’d like to contribute a short quote about the benefits of dressing well. For these guys, contributing is a no brainer. It takes two minutes or less, and they get a mention and link to their site. I’ve been asked to contribute to many of these round up style posts, and I never turn down the opportunity. Never say no to a free backlink, ever! Since I wanted this to be an “epic” piece of content, I supplemented the experts’ quotes with a bunch of my own observations to get to 100 items, which is much more impressive than just 5 or 10. When I published this post, I sent a link to everyone who contributed, and I tagged all of them when I shared the post on social media. The result was over 2,000 social shares and a ton of long term traffic. Send them personal, thoughtful emails to ask if they’re like to contribute (make it easy for them to say no). Try to include some heavy hitters in your industry – people who are way more popular than you. You may be surprised at the result! Challenge: Think of a round up style post that would make sense for your blog, and make a list of 20-30 people you could reach out to. Celebrity names tend to have high search volume because, well, these people are famous. And it makes sense for fashion bloggers to write about celebrities who are known for having great style or a particular look. For example, I watched Master of None on Netflix and noticed that Aziz Ansari’s character, true to life, dressed really well. 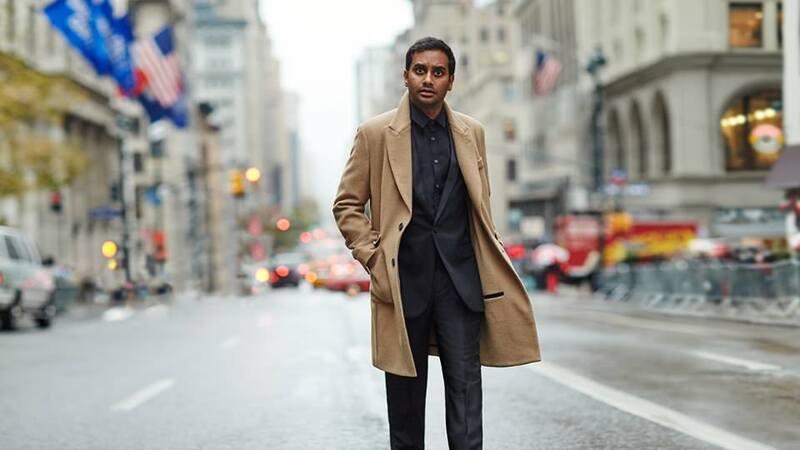 Ansari is known for his style and has been featured on sites like Mr. Porter. Since my blog covers style for shorter men, I decided to write an article all about Ansari’s style in Master of None (this was before the scandal btw). The cool thing about this article is, if there’s another season of the show, or if it’s syndicated in any way, I’ll get an uptick in organic traffic. Challenge: Which celebrities can you write about? Make a list of 5 celebrities whose style you can break down on your blog. If you’re not sure who to include, ask your followers on Instagram who they want you to cover, then start writing! Here’s another solid, time-tested type of content that every fashion blogger should be focusing on: how to wear xyz. You get the idea. The list goes on and on and on. Granted, some ideas are going to be less competitive than others. The more specific your idea is, the less competitive it will be. The more trendy, the less evergreen. I’d start by going after relatively specific or even trendy categories. Not specific products, but overarching categories (e.g., light wash jeans vs. Banana Republic skinny light wash jeans). Notice that this post is in-depth and includes lots of original media, including video. It’s nicely formatted and optimized for search. 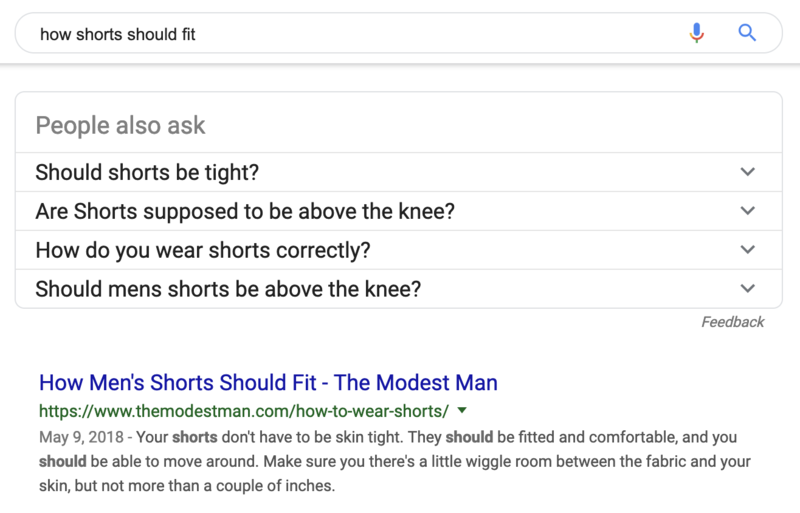 This post is the #1 search result for “how should should fit” at the time of writing. That’s why it does so well organically. Challenge: Come up with 2-3 “how to wear” categories you feel qualified to cover. Try starting with items you wear all the time anyway. Maybe it’s a certain color of denim or type of jacket. Bonus points if you already have all the photos you need! This is similar to the “how to wear” post in that it’s not just targeting a specific product. It’s targeting a product category. Everyone wants the best version of everything. That’s why everyone searches for “best xyz” when they first start researching something they’re going to buy online. Once they hone in on a specific product, they might look for a product review, but research typically starts at a higher level. If you can own search engine real estate for product categories, that’s a very powerful place to be. But it’s also way more competitive than going after specific product reviews. Have you noticed what the big sites like Wirecutter and Reviews.com are doing? They’re dominating search results for “best of” product categories. If you Google “best electronic toothbrush” or “best running shoes” you’ll likely find one of these bigger publishers. And most people don’t understand just how much cash these sites are raking in through affiliate programs. Smaller sites can use this exact same strategy. 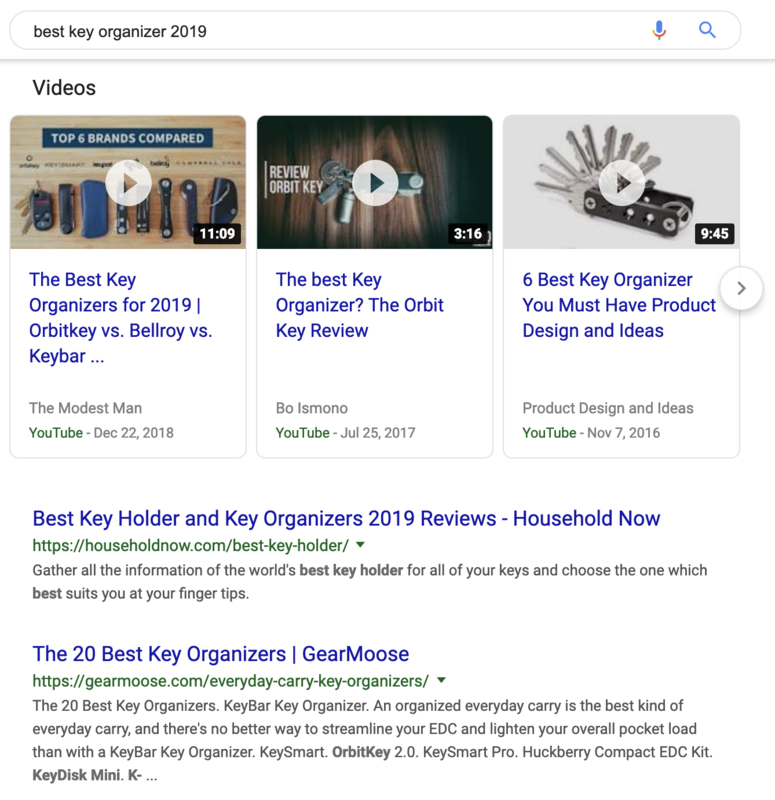 For example, I’m going after “best key organizers” over on my blog and YouTube channel, and I’m confident that my content will rank in the #1 spot, eventually. Why? Because I created the best piece of content on that subject. I put more research into actually finding the best key organizers, while other sites simply wrote up a quick list based on Amazon reviews. If you do rank highly for any of these broad categories, don’t expect it to last forever. Other websites catch on, and things get very competitive. I used to rank #1 for “best no show socks” until everyone else jumped on the bandwagon! Challenge: What “best xyz” have you searched for recently? What product categories do you feel qualified to write about? Think of 1-2 topics, and start developing your first in-depth piece of “best xyz” content. Most fashion bloggers are doing the same thing over and over and over. They’re posting daily outfits, doing weekend sale round ups, etc. They’re putting so much time and emotional energy into their blogs, but they’re not making much money. Do something different. Pick one or two of these six post ideas I’ve outlined, and focus on them for the next month. Go for quality over quantity. It takes time to create a great piece of content, but you’ll reap the benefits for months or even years. Remember, some of my best content on The Modest Man was published several years ago. These posts still get traffic, and they still generate revenue from affiliate programs and ads. Trust me. Just try it. I think you’ll be pleasantly surprised by the results! If you have any questions for me, leave a comment below. If you want more tips, sign up for my email list using the below form.